The Kingdom Flying Club was formed in late 2000 by ex-college friends Matt O'Neill (piano, guitar, vocals) and Jarrett Crader(bass, vocals), who had previously performed as The Lesch-Nyhan Syndrome. They were joined in Columbia, Missouri by Daniel Stegall (guitar), a childhood friend of Crader's, and Stegall's wife (then girlfriend) Rebecca Baxter (drums). They self-released a 6 song ep, 'Minutes from the Meeting', which garnered them the love of local University of Missouri station KCOU, most notably it's top dj, Jason Cafer. The followed that up by recording 7 more songs to flesh out 'Minutes', after which Stegall and Baxter left to join the then fledgling Foundry Field Recordings. Crader and O'Neill enlisted Steve Davis (drums) and Nathan Kesterson (guitar), two works friends, to record 'Non-Fiction', their full length debut on Emergency Umbrella Records. 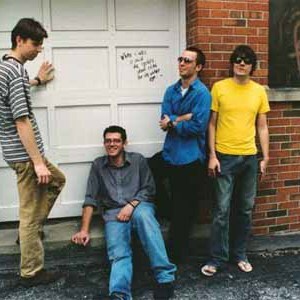 One of the tracks, 'Artists are Boring', was used in an episode of the O.C., and they toured the country on their next ep, 'Sumatra Fox' with replacement drummer Seth Ashley. They disbanded in 2005 when O'Neill moved to Japan to teach English. Crader remains in Columbia, Missouri, and is currently part owner of Emergency Umbrella.